The price of razor refills is ridiculous. However, the cute Venus-esque Target brand one? Not the same. Unless you like cuts and blood. Suave conditioner is a beautiful alternative to shave gel. Helps lessen the sting of the cost of the dumb razors. But do not, I repeat, do not use it on your hair. Unless you like dreadlocks and crying. If I ever invent a new hair care line, or if a hair care line ever asked me what I want most, this is it. Conditioner bottles should always be twice as big as shampoo bottles. But cost the same. Don't accidently shut your flat iron on your earlobe. Alba products rock my world. I pretend that I am in Kauai every time I use them. I am in pretend Kauai a lot. I wish I was in real Kauai more than pretend Kauai. Dental insurance is an oxymoron. I think it would be much more fun to throw money in a trash can and light it on fire. Then roast s'mores on the flames. Totally agree about the razor thing- how is the price justified? But it never ends well to go with the cheapo ones. Oh, and I laughed out loud when you said you want the conditioner to be 2X as big, because it's the exact opposite for me. You are the best. Enough said. I love the randomness. :) My blog post today was titled "random." Great minds, I tell ya. I thought we had great dental insurance. But then we found out our oldest needs braces. Yep. Not covered. Awesome. Such a cute post!!! Love it!! So true, every single word. I hope you don't mind, but I shared a link to this post on my blog just now. Thanks for the smile today! I think the same thing every time I pick up the conditioner. Thanks another good laugh at something we all deal with! I'm the same with the conditioner. I need twice as much as shampoo. And I don't buy the cheap stuff because I have high maintenance hair. Have you ever had a brazilian blowout. If it's anything like a brazilian bikini wax, I want nothing to do with it. ;) But I hear it's all the rage for those of us that never leave home without the straightening iron (or our good conditioner). Amen to larger conditioner bottles. Someone in the haircare industry listening out there??? i totally agree about dental insurance. it's like vision insurance. i love paying a monthly deductible just so i can get a discount on overpriced frames. love it. i think it might be my favorite way to waste money. with dental insurance running a close second of course. I use the same razor, and you're right! The refills are ridiculous! I always make sure I have a coupon, but it's still $$$. The best thing I use for shaving is skin so soft. Seriously, awesome. i agree with everything in this post. especially about the ridiculous price of razor refills and the need for larger conditioner bottles. will have to try your conditioner/shaving cream trick! Razor blades are WAY expensive. And I have a feeling in ten years there are going to be 30 blades in those puppy. What happened to the two blades that were just find for 30 years! Now my husband's razor has five or six. I have lost count! I actually only use conditioner every couple of days, so I buy two shampoos for every conditioner! I laughed (coughed, snorted, and sniffled) at your post. All you say is true. That's what makes it so funny. Those smores will make you need more dental and, by association, more of the imaginary insurance. 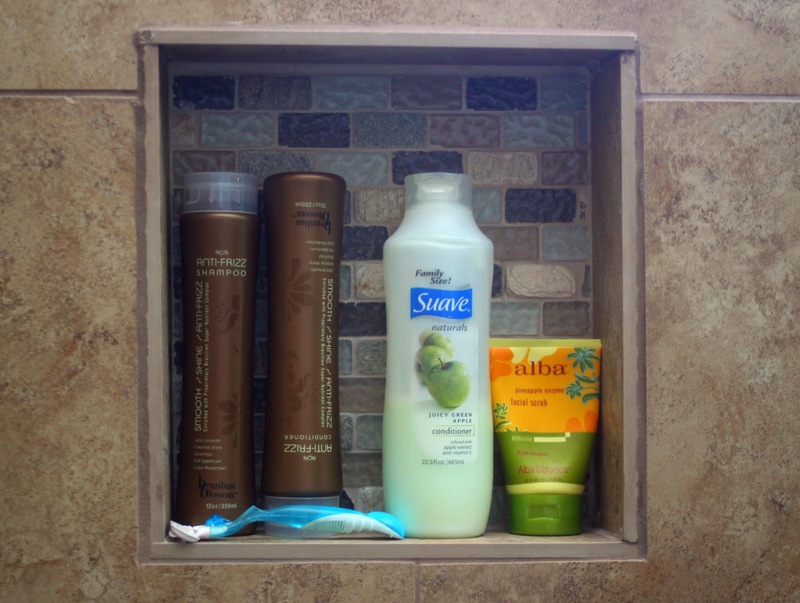 I'm loving your tile in the shampoo cubby of your shower. I have very thin hair, so the Sauve products work OK for me. However the razor refills are outrageous!! They have them under lock and key at my grocery store. That right there tells you they are too pricey b/c people are stealing them. Insane! can you make this a weekly routine and if so can i have you as a do a guest post sometime this month on my blog. you are hilarious! I use that shampoo and conditioner and always have and I do NOT have dreadlocks! Haha, it works great for me and every time I try something else, my hair is ridiculous. I just find your blog to be delightful! Thanks so much for always making me smile! but yes, damn those venus prices! even at costco! Totally true about the razors. I'm a little bit of a razor snob and like the men's razors better. Closer shave. My legs stay smoother longer. I'm totally sold. Luckily for my pocketbook there are lots of coupons and sales (CVS!!!) on some of my favorites. Random posts are pretty much my favorite. Agreed on all accounts. ADORE Alba!! I wish Costco would sell a giant jug of their cocoa butter and coconut milk body wash. I loooove alba as well. And this post; it was the light laugh I needed after a crazy muggy headache of a day. Ah yes, my dear Venus Embrace...when I bought the razor on clearance at Target soon after they came out, I didn't realize that they'd try to take my right arm for the refills. HOWEVER...I "made" the sweetheart order me a bunch on eBay. Seriously, SO much cheaper and I'm just now running low. Now I just need to figure out if I can still find them on eBay. last week....i took a picture of my shampoo bottles. how weird and random is that?!!! walmart quit carrying the cheap brand of razors!! so my only choice is gillette. haha...me and you have totally lived the same life the past weeks. Husband bought razor refills at wal-mart for me told me it was 14 bucks. I was like did you get the mega pack. He said no the 4 pack. That is highway robbery!!! And the dental insurance. Yeah we bought up so we could use our dentist. How can you pay more a month for it only to have to pay more at the dentist. So glad my first daughter sucked the life out of my teeth. Still have a whole side to fix. Better go remortgage the house to pay for that!!! Thanks for the open venting time. I needed it!!!! Any tips now, for any decent conditioners without propylene glycol? lol. I'm allergic to all the good ones! thanks for the tip on target razors, i will keep paying mucho dollars for the real deal. did you know only use conditioner about 2 times a month? My hair dresser hates me for that. So does my hair! I use Schick Intuition.. I've spent insane amounts of money on their refills.. Ugh! I'm the opposite on the bottles though. I always have SO MUCH conditioner left over. So I buy 2 shampoos for 1 conditioner. oh! oh! oh! i am hopping mad! i can only use venus. i use suave shampoo on my legs instead of on my head. your posts make me laugh and cry! i love you i love you i love you! Okay - I am going to let you all in on a breakthrough with the razor refills. DRY THEM AFTER USING THEM!!!! It works. I heard it on the radio one morning on the way to work and have implememnted it since then. It can add a month to one razor refill. You need to shake the excess water off of it and then give it a few passes with your hair dryer. Don't store it in the shower, just take it in and out with you. I promise it makes a difference! I have never commented on here before, just been a lurker for a while, but I felt the need for a PSA on this topic. Oh, and, use coupons with drug store sales to get those razors for less than $1 per refill!!!! For real. I do! I wish I was in real Kuaui too. Conditioner for shave gel...thanks for the tip. My husband and I were just talking about the cost of razor blades this morning. Out of control. I also use suave conditioner to shave and I agree with you on the pricing. I have to admit, I have been stalking your blog! I found you when I was looking for bandanna dresses. Loved making it for my daughter. anyways, just thought I'd introduce myself since I have been getting to know you secretly! Come visit my blog anytime, you will probably see some of your great ideas passed along there. Thanks! so agree w/the razor refills I do not comprehend how some little pieces of metal and plastic need to cost as much as they do. I feel the shampoo needs to be double not the conditioner lol. and I love love love albas products especially their green tea sunscreen honestly the only good smelling sunscreen. You could devote a whole post on the perfect razor... Not sure if anyone else would read it, but I would. I just threw away the Schick one I bought last week- thought I was feeling stubbly hairs on my legs after shaving- it was actually SKIN.Nice. AND the fact that a razor with 2 replacement heads costs half the price as the replacement blades. Wha?? I'll just buy 2 razors, I guess. One for each hand? Everytime I used Alba, it made me want macaroons! I was looking for someone to say it and one person did: it's ALL about Trader's shave gel...it costs like $3.50 and lasts forever. Forever. (think "Sandlot"). You must must must try it!!! It'll be your new BFF. I have used it for about 8 years and never (yes, never) have any razor burn. The stuff might just bring about world peace. so true. why are thin, metal strips w/ a little plastic so much $$$?! I have tried practically every brand of shampoo... I am not at all loyal to 1 brand. (and kinda feel bad about it)... I'm currently using Tresemme - got a HUGE bottle of conditioner and shampoo at Sam's. amen to razor refills they are ridiculous!!! I could have my hair electrified off and save money in the long run! Ahhh yes!! My shampoo always lasts twice as long as the conditioner. Frustrating!! pet insurance is pretty much the same. If your dog breaks a nail it might be covered under your policy, but everything else is out of your own pocket and never under $100. I was laughing so hard when I read this post! I totally agree. Have you ever tried using olive oil for shaving? I used to get razor burn and horrible cuts every single time I shaved my legs. Olive oil does the trick. And then you really don't have to moisturize much afterward either! OMGosh that just make me cry with laughter and boy did i need it today! Thanks for that. I really needed this today. A nose snort laugh moment. It was the dental insurance musing that got me. Totally been there.